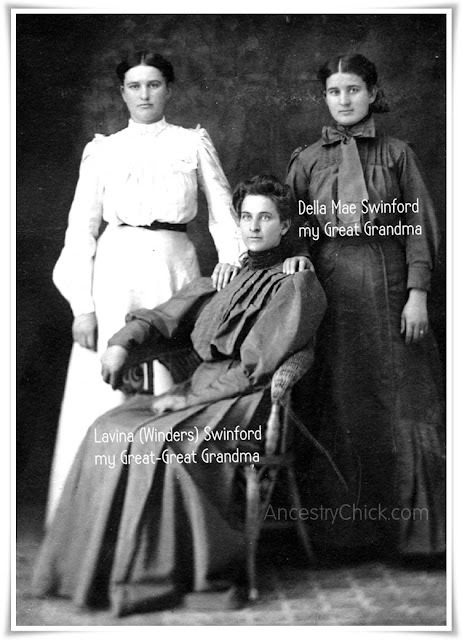 This week, for Forget Me Not Friday, I'm featuring two generations of my maternal ancestors: my great grandmother, Della Mae (Swinford) Kephart, and her mother, my great, great grandmother, Lavina Elizabeth (Winders) Swinford. Lavina Winders was born in Illinois on May 21, 1852 to Andrew Jackson Winders. 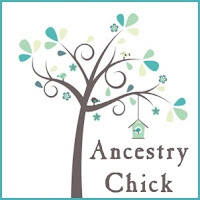 Her mother is unknown, and is one of the biggest brick walls in my family tree. Andrew was likely married and perhaps his first wife died. He would later marry Delila Nestleroad, who is quite often mistaken for Lavina's mother in many family trees. However, Andrew and Delila didn't marry until 1854, and Delila would only have been 14 at the time of Lavina's birth. Delila was also born in Ohio and living there when she married Andrew. So it doesn't quite add up for her to be Lavina's mother. The search for Lavina's mother's identity continues. Lavina would later marry Jonathan J Swinford in 1875 in Missouri. Together they would have eight children by the time they moved into the Oklahoma Territory in 1889 and become what is known as '89ers. One of those children was Della Mae, my great grandmother. You see both of these ladies in the photo. The other woman in the photo is likely one of Lavina's other daughters, either Ethel or Grace. I haven't yet figured out which one. Jonathan and Lavina would have 2 more children, and the couple would live most of the rest of their lives in Wellston, Lincoln County, Oklahoma. Lavina died on June 6, 1915 in Wellston. Della would marry my great grandfather, John Arthur Kephart, and they too would live out their lives and die in Wellston. Della died on April 7, 1976. I still remember the day we got the news. My mom had been very close to her. It was so hard to watch her and my grandmother grieve this loss. I love the photo of these two grandmothers of mine. And I love being able to help preserve their memory by keeping their history alive here on the blog, and in my heart.